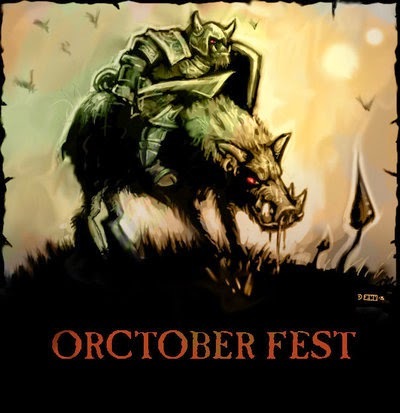 For Orctober I've been discussing the evolution of the orc, from Tolkien to the present. There's one feature I'd like to zero in on today... the colour of their skin. How did they become green? I've already noted how Tolkien envisaged most orcs as having sallow (i.e. yellow) skin. However, in The Lord of the Rings he wrote about different breeds of orc. In Tolkien's mind, the nastier the orc, the darker his skin. In Moria (in The Fellowship of the Ring), Gandalf surveys a war party of orcs and mentions that some are stand out as "large and evil: black Uruks of Mordor". (Uruk is the word for orc in Black Speech). And in The Two Towers (1954), the narrator describes one of Saruman's elite orcs as "a large black Orc". Whether Saruman's black orcs and Mordor's black orcs are the same breed is not clear from the books, but the important thing for my purposes is that they were black. Hmm, asiatic orcs, black orcs... Tolkien does seem to be hitting a lot of squares on the Bingo Card of Unfortunate Stereotypes. Well whatever - we know from the Old Man's speeches and letters that he abhorred apartheid and antisemitism. In any case, Gary Gygax's pig-faced orcs were not really green either. The Monster Manual (1977) describes them as "brown or brownish green with a bluish sheen". Ah yes, the colour of a spoiled ham... but still not the snot green that we've come to expect. I have two theories for how orcs became green. The first is that it is all Spiderman's fault. 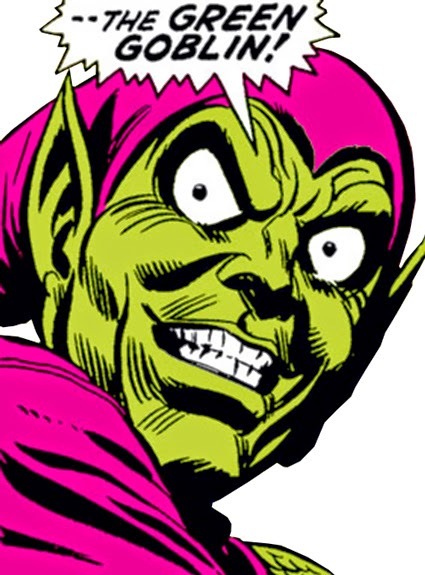 Although I can't find any trace of green goblins in early English poetry or children's books, Spidey's nemisis, the Green Goblin, has been kicking around since 1964. The influence of Marvel Comics has been so great, it seems natural to me that the bright green of this villain's skin would have leached into the fantasy genre. My second theory is less likely but more fun. I think (or hope) is was Fungus the Bogeyman who turned orcs green. 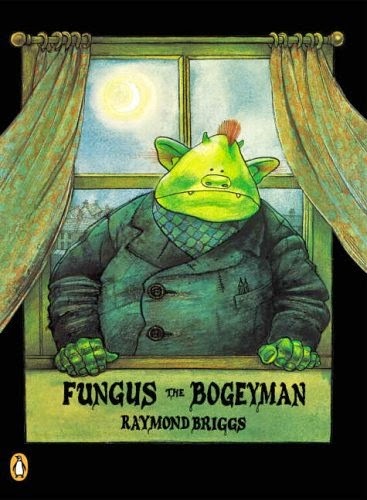 For those of you who were cruelly deprived of bad influences when you were children, Fungus the Bogeyman (1977) is a children's book by British artist Raymond Briggs. It has been called "the nastiest book ever published for children" and "a masterpiece of complex nihilism". The titular character has that fluorescent green which became the hallmark of Games Workshop's orcs in the early 1980's. So how did orc's become green? It was Fungus' fault. And... there's that thing with Orcs being Fungus based life forms... and Bryan and Ricks Fungoid Trolls, you might just be on to something! 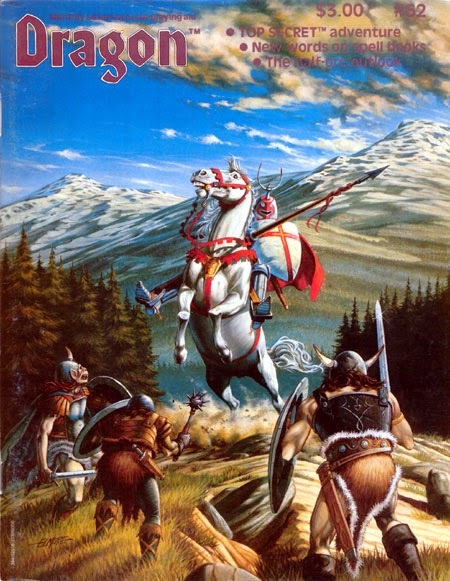 Coincidently the Hildebrandts green orcs were also 1977 Tolkien calender. My belief (as in without proof) is that the first part of you discourse is correct. In the 80's it just seamed wrong to paint all your goodies white and all your badies brown. Why they plumped for green is anotyher story and possibly it is for the same reason both the green goblin and Fungus are green, it looks freeking cool! One of the citadel painting guides by Rick Priestly, I think, states that Dave Andrews and his gaming group were the first to paint orcs green in the 1980s, whereas before they had been a brownish colour. "Matt, I was going to suggest that possibly the animated Hobbit or Lord of the Rings movies might be responsible for the green tinting of the orcs but a quick check doesn't necessarily support this thought. The LOTR movie depicts them in more of a grayish tint. The Hobbit movie leans more towards the greenish hues but even these guys look more gray to me. Amazing how your memory changes as you age; I would have sworn that they were green in both movies if I hadn't looked them up. Is the green skin just a total GWS fabrication? Possibly to avoid any issues with the Tolkien estate?﻿"
I think G. Warburton's comment is fascinating... I'd love to track down that painting guide -- does anyone know what year it's from? Was it in a White Dwarf? "It's impossible to overstate just what an impact Dave has had on the Warhammer world. For instance, it was Dave's band of gamers - the Player's Guild - who were the first to paint Orcs green." Good find, George... That's one for the archives!